SALT LAKE CITY, UT --(Marketwired - January 20, 2017) - The Utah Jazz and Mountain America Credit Union announced today that GiGi's Playhouse Layton is this season's third recipient of "Pass It Along," a program featuring fan nomination opportunities that rewards five local charitable organizations with $5,000 each. GiGi's Playhouse Layton, which provides specialized teaching and support to individuals with Down syndrome, their families and the community free of charge, will be presented with a $5,000 donation prior to the Saturday, Jan. 21 game vs. the Indiana Pacers at Vivint Smart Home Arena. The photo and check presentation will take place on center court at 5 p.m.
"We are so appreciative of this generous donation," said Brittanie Flint, president of GiGi's Playhouse Layton. "With this contribution to our organization we will be able to keep all our programs going and free to all our participants. We would like to thank Mountain America Credit Union and the Jazz for this gift." In addition to the $5,000 donation, GiGi's Playhouse Layton received a visit from Mountain America Credit Union President and CEO Sterling Nielsen and Salt Lake City Stars mascot Buster, as well as tickets to Saturday's game. Fans are encouraged to nominate local charitable groups that they feel go above and beyond in giving back to the community via www.utahjazz.com/passitalong. One winner will be announced each month through March 2017, for a total of $25,000 being donated to five deserving organizations. The Paiute Tribe of Utah Native Youth Program and Head Start, the first two 2015-16 "Pass It Along" recipients, were recognized Nov. 29 and Dec. 14, respectively. Founded as the 18th member of the National Basketball Association (NBA) in 1974, and located in Salt Lake City since 1979, the Utah Jazz are committed to excellence as a team and in the community. On the court, the Jazz are the third-winningest team in the NBA over the last 30 years, having won eight division titles and two Western Conference championships along with 14 seasons of 50-plus wins, and are supported by one of the most passionate fan bases in all of sports. Away from the court, the Jazz are very active in the local community and have assisted a multitude of organizations and worthy causes by way of charitable donations, service and grants through Larry H. Miller Charities. The Utah Jazz also operate the Junior Jazz program, the largest and longest-running youth basketball league in the NBA, featuring more than 55,000 players and an additional 13,000 volunteers who take part annually across seven states. For more information on the Utah Jazz, visit www.utahjazz.com. Mountain America Credit Union has more than $5.9 billion in assets and serves more than 700,000 members, wherever they are, through online and mobile banking, 86 branches in five states, and access to more than 50,000 surcharge-free ATMs and 5,000 shared-branching locations nationwide. With roots dating back to the 1930s, Mountain America offers a variety of financial products and services for consumers and businesses, including checking and savings accounts, auto loans, mortgage loans, business checking, student loans, SBA loans and retirement options. Visit www.macu.com for more information. 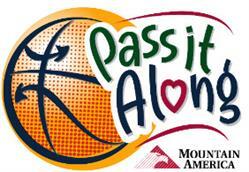 The Utah Jazz and Mountain America Credit Union present "Pass It Along," a program featuring fan nomination opportunities that rewards five local charitable organizations with $5,000 each.